SBV Vitesse (Stichting Betaald Voetbal Vitesse), widely known as Vitesse Arnhem, or simply as Vitesse (Dutch pronunciation: [viˈtɛsə]), is a Dutch professional football club based in Arnhem (Gelderland). Established on 14 May 1892, Vitesse is the oldest professional football club in the Eredivisie. The club has enjoyed some success in the competition, has featured in the UEFA Cup competition and became the first Dutch football club to be owned by a foreigner when it was taken over by Georgian businessman Merab Zjordania in 2010. Since 1998, the club has played its home games at the GelreDome. Their best result in the Eredivisie was third place in 1997–98. The club won the KNVB Cup in 2016–17. Throughout the years, Vitesse established itself as a stepping stone for future world class players like Willem Hesselink, Just Göbel, Roy Makaay, Pierre van Hooijdonk, Mahamadou Diarra, Philip Cocu, Nikos Machlas, Sander Westerveld, Raimond van der Gouw, Wilfried Bony, Marco van Ginkel and Nemanja Matić. Vitesse, founded in 1892, are the 2nd oldest professional football club still in existence in the Netherlands, after Sparta Rotterdam who were formed in 1888. The roots of Vitesse actually pre-dated Sparta by a year as in 1887, a club with the name "Arnhemsche cricket- en voetbalvereeniging Vitesse" was formed by a group of high school students who played their sport on the Rijnkade, overlooking the River Rhine in the city centre. Reluctant to choose a Latin or English name for the club as they felt those languages were too elitist, they picked the French word Vitesse, meaning "speed". In 1891 the club disbanded as they were no longer able to find anywhere suitable to play cricket after a Velodrome was built on their usual playing field in the Klarenbeek Park. The following year a group of wealthy students resurrected the sports club, this time with the name AVC (Arnhemse Voetbal en Cricketclub) Vitesse. In the summer they played cricket and in the winter football. In the end of 1892, Vitesse played its first real football match, and in 1894 Vitesse disbanded the cricket branch. In 1895 and 1896 Vitesse became champions of the Gelderland competition. From the foundation of the Dutch national football championship in 1898 until 1954, the title was decided through play-offs by a handful of clubs who had previously won their regional league. Vitesse lost the final of the national championship six times (1898, 1899, 1903, 1913, 1914 and 1915). In 1912, Vitesse reached the final of the Dutch Cup Tournament for the first time. Vitesse lost the final with 0–2 from HFC Haarlem. In this period Vitesse had top players, likes Willem Hesselink and Just Göbel. This players were also active in the Dutch national team. In 1914 John William Sutcliffe became the first foreign trainer. During World War II, Vitesse didn't play-official matches because playing football in the open air was forbidden. During the Battle of Arnhem, the residents of the city were forcibly evicted from their homes, allowing the Germans to turn the north bank of the Rhine into a heavily defended line. Residents were not allowed to return home without a permit and most did not return until after the war. The football field and clubhouse was completely destroyed. The damage was repaired in the years after the liberation. In 1984 it was decided to divide the professional and amateur sections of the club. The professional section was renamed SBV (Stichting Betaald Voetbal – "Professional Football Foundation") Vitesse whilst the amateur section became "Vitesse 1892", which lasted until they disbanded in 2009. From 1984, Karel Aalbers was the president of SBV Vitesse. 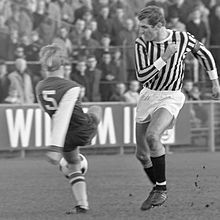 Aalbers' goal was to bring Vitesse from the bottom of the Second League (Eerste divisie, now Jupiler League), the league in which the club originated, to the top 40 soccer clubs of Europe. He developed the basic idea for the 'Gelredome', a stadium with a sliding pitch that can be moved out of the building. Later, the same system was applied in Gelsenkirchen (Schalke 04) and in Japan. Events such as pop concerts can be held without damaging the grass. Gelredome opened in 1998. It has a roof that can be opened and closed. It is fully climate controlled as well. In the first season after the opening, Gelredome's attendance rose to 20,000, (from less than 8,000 in the old stadium). Vitesse made their debut in European competition in 1990. The club won their first match in the first round 1–0 over Derry City. The club remained financially sound through making notable profits on the transfer market. Players such as Roy Makaay, Sander Westerveld, Nikos Machlas, Glenn Helder and Philip Cocu were sold for large sums of money. Others came to occupy empty player positions, such as Mahamadou Diarra and Pierre van Hooijdonk. Vitesse finished in top 4 positions, made profits and showed a solid balance sheet in the final years of Aalbers' presidency. Also, the club became regular competitors in the UEFA Cup and in 1997–1998 finished third in the Eredivise, its record highest finish to date. 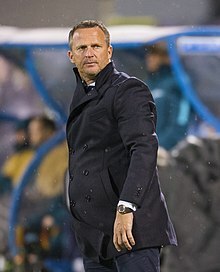 Herbert Neumann was Vitesse's manager over most of these years (1992–95 and 1998–99), while star players included: Nikos Machlas, the first ever Vitesse player to win the European Golden Boot in 1998 when he scored 34 goals in a season; John van den Brom, who played 378 matches for Vitesse during this period scoring 110 goals from midfield; and Edward Sturing, who played 383 matches in defence for Vitesse from 1987 to 1998, as well as receiving 3 caps for the Netherlands national team. Additional stars included Dejan Čurović, who spent six years at Vitesse playing 109 matches as a striker, scoring 41 goals including the first goal in GelreDome. Meanwhile, Dutch forward Roy Makaay spent four years at Vitesse, scoring 42 goals in 109 matches between 1993 and 1997. Aalbers resigned on 15 February 2000, after the main sponsor, Nuon, threatened to pull the plug if he did not. Nuon, as a public utility company owned by local authorities, had trouble explaining why it invested heavily in Aalbers' ambitious plans. His successor was Jan Koning (former chief of Sara Lee/DE who resigned after four months). In a short period of time, Vitesse began to show negative financial results due to poor deals on the transfer market. The club survived numerous financial crises, such as the last one in 2008, when debts were bought off, under the threat of bankruptcy. The club was in serious financial trouble, and in August 2010 its majority shareholder agreed to sell the club to the Georgian businessman Merab Jordania. There was rumors that this purchase was engineered by Chelsea owner Roman Abramovich. The club underwent a successful transformation into a modern, commercial sports organization and established itself as one of the dominant teams of the Eredivisie. In November 2013, Vitesse was top of the league in the Eredivisie for the first time since 2006. It was the first time since 2000 they'd been top of the league later than the first week. Halfway through the season, after 17 matches, Vitesse was the leader in the competition. In April 2017, the club won its first major trophy in its 125-year existence, defeating AZ by a score of 2–0 in the final of the KNVB Cup, with two goals from Ricky van Wolfswinkel. On 5 August 2017 Vitesse were beaten 1–1 (4–2 pen.) at De Kuip, Rotterdam in the Johan Cruyff Shield final by Feyenoord. In the 2017–18 UEFA Europa League group stage, Vitesse's opponents were Lazio Roma, OGC Nice and Zulte Waregem. Vitesse ultimately finished the group stage in fourth place. GelreDome with closed roof and pitch outside. The GelreDome is the home stadium of Vitesse, one of the largest stadiums in the Netherlands. The stadium has a retractable roof and a convertible pitch that can be retracted when unused during concerts or other events held at the stadium. In 1998, the GelreDome replaced the Nieuw Monnikenhuize. The stadium was able to hold 12,000 people in a mix of seats and standing, however with the addition of temporary bleachers it could be raised to 18,000. 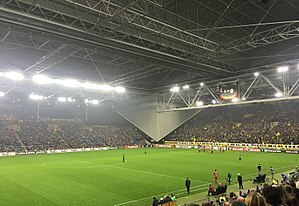 After the increasing popularity of Vitesse in the 1990s, it became obvious that the traditional ground was too small for the increasing number of Vitesse supporters. The stadium has a maximum capacity of 21,000 people for sports events, or 41,000 during concerts. The GelreDome pitch is surrounded on each side by four covered all-seater stands, officially known as the Edward Sturing Stand (North), Charly Bosveld Stand (East), Theo Bos Stand (South) and Just Göbel Stand (West). Vitesse's training ground and Academy are based at the Olympic Training Centre Papendal, located in the Veluwe woods, 8km northwest of the city centre. Papendal is also the home base of NOC*NSF. Around 550 top athletes use the facilities of Papendal, 400 on a daily basis. The year 2013 was marked by the official opening of the new Vitesse Training Centre. The complex has been inspired by Cobham Training Centre (Chelsea FC). Even though the Papendal complex is of a more modest format, it has many similar facilities, such as a weight training room, a state-of-the-art therapy bath, a steam room, sports medical rooms, a press reception area and separate restaurants for visitors and players. On the grounds, there are 6 full size football pitches of which one is astro turf. A stand has been built at the Academy's main pitch, with a capacity of over 500 people. The reserve squad and academy teams all play their matches here. The complex is situated in large wooded area, where the players can prepare in a peaceful and private environment, whilst not being too far from the hustle and bustle of Arnhem's city centre. Besides having the most advanced and up-to-date sports and training complexes, Papendal is also the base for administration staff, scouting department and all club coaches. There are eleven dressing rooms, physiotherapy suites and a base for the medical staff, including a consulting room. Main football field of Vitesse, where the youth plays their competitions. Vitesse's crest is composed of an eagle. Vitesse are well known for the American bald Eagle 'Hertog', which is released before the match and flies over the crowds. Theo Bos spent his entire playing career for Vitesse, making a total 369 appearances in 14 seasons with his club. He is therefore considered to be Mister Vitesse. Bos died on 28 February 2013 of pancreatic cancer, aged forty-seven. Following his death, a special remembrance to honour Theo Bos took place at Gelredome with around 7,000 Vitesse supporters. As of the 2012–13 season, no player could wear the number 4 shirt at Vitesse after the club decided to retire the shirt out of respect for Theo Bos, "the legendary number four". Dutch defender Jan-Arie van der Heijden was the last player to wear the number. Around September there is an annual 'Airborne memorial' football match. During this annual Airborne-match the veterans of World War II will be honored. The Gelredome is decorated with Airborne flags, both outside and inside the stadium, and at halftime, 120 members of the Royal British Legion played the bagpipes with some other musical guests. The match is traditionally visited by veterans who were fighting in this battle, while a special shirt is worn by Vitesse. Vitesse drop their normal striped black and yellow kit for this special match. Instead they wear claret and blue outfits, the same colours of the 1st Airborne Division, with a 1st Airborne 'winged horse' emblem also etched on the kit. These shirts are after the match auctioned for charity. Johnny Peters was one of the first Brits on September 17, 1944 to be part of the Battle of Arnhem. After the war, He became the chairman of the Arnhem 1944 Veterans Club. Since 2007, Peters visited Vitesse each year for the Airborne match in september. In 2012, Captain Guram Kashia went over to Peters to express his thanks for coming to the match, gave him his shirt (which Peters donated to the Airborne Assault Museum in Duxford), stood at what we'll loosely call attention, and saluted Peters. A year later, on the match commemorating, the Vitesse supporters unveiled a banner capturing the moment between Peters and Kashia. Johnny Peters died on 8 august 2014 after a short illness. 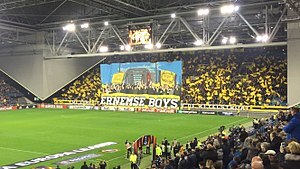 Vitesse fans are known to be creative and have various songs and chants during matches. Among the most important Vitesse songs are "Geel en Zwart zijn onze kleuren" by Emile Hartkamp, and "Bouw mee aan een steengoed Vites!" by Henk Bleker & Enka Harmonie. Vitesse opens its home matches with "Whatever You Want" by Status Quo, and after every home goal "Bro Hymn" by Pennywise is played. The club's shirt consists of black-yellow vertical stripes, inspired by the colours of the flag of Gelderland. Its colours originate from the coat of arms of Gelderland which in turn was based on the coat of arms of the Duchy of Guelders. The first logo of Vitesse was a shield-shaped crest. In the middle there was a diagonal dividing line between the left yellow face and the right black box. In the left box, "AVC Vitesse" was diagonally written and in the right-hand side, "1892 ", the club's founding year. The old logo was replaced in 1984, the year in which the roads of the BVO branch and the amateur branch separated. The amateur branch retained the logo with limited modification, SBV Vitesse got a new logo. The new logo of the BVO from 1984 is once again a shield-shaped figure, but it has straight lines at both the top and sides of the logo. At the top is with thick white uppercase Vitesse. Under the name is a double-headed eagle, with left and right half mirrored. Also the colors are mirrored, which is left yellow is black right and vice versa. This double-headed eagle can also be found in the coat of arms of Arnhem. In the middle of the logo is a football positioned. In the autumn of 2011, a new version of the logo was put into use; A total of 13 changes have been made. For example, the symmetry of the eagle was improved, the black outer edge replaced by a white and in the writing has been made thinner. The football has been altered in terms of appearance as a shadow effect is added and (if the context allows it) the year of creation as text EST. 1892 under the logo can be found. There was also a special anniversary crest to celebrate the 125th (2017) anniversary of the club. Vitesse wore sponsored shirts for the first time in the 1982–83 season, to promote the Akai. The club signed its first kit manufacturing deal with the German firm adidas. The kit is being produced by Macron for the 2018–19 season. 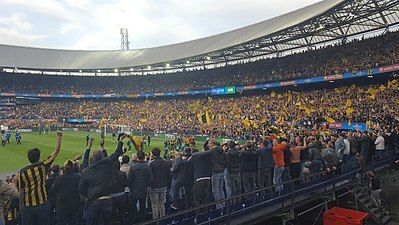 Vitesse fans at the 2017 Dutch Cup Final in Rotterdam. The supporters of the club are known as Vitessenaren. Vitesse has two independent fan bodies. The Supportersvereniging Vitesse was founded in 1992 and currently consists of 3,000 members. They own a fan base within the GelreDome. The second one, Arnhem Ultras, serve a more specific purpose: to improve the atmosphere in the stadium. Besides the fan unions, there are several sets of fans who work together on tifo choreography, likes VIVO (Vitesse Is van Ons), De Aftrap and VAK 113 among others. Nowadays, Vitesse is supported by one fanatic side: The Theo Bos – South Stand. This stand is responsible for a big part of the atmosphere in the stadium. 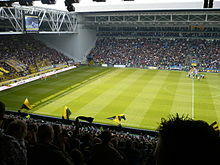 Vitesse have attracted around 18,000 people to Eredivisie matches on average in the last years. The record attendance stands at 26,600, achieved in a match against NAC Breda at March 25, 1998. Research showed that about 10,000 season ticket holders from Gelderland, with other significant groups coming from Utrecht, South Holland and North Rhine-Westphalia. The Vitesse Kids Club was founded by Vitesse in 1998 for children up to 16 years. Every year, the Vitesse Kids Club Day is organized, offering activities for members who are joined by the first team squad. During pre-season, Vitesse also holds an Open Day for people of all ages; the event gives the opportunity for sponsors and new player signings to be presented. Vitesse fans have established a close friendship with the supporters of FC Petrolul Ploiești and RFC de Liège. Back in the days they had a friendship with Lierse SK till there was a big riot between them at a friendly match in 2011. NEC from Nijmegen are Vitesse's archrivals. The two clubs share a long history together and matches between the two clubs are called the Gelderse Derby (Derby of Gelderland). The rivalry between these two clubs goes beyond the football rivalry, it transcends into the city rivalry between the two largest cities of Gelderland: Nijmegen and Arnhem. This city rivalry began when these two cities first received their city rights. The two cities are just 20 kilometres apart, leading to an intense feeling of a cross-town rivalry, heightened by a feeling that local pride is at stake. The meeting between the two teams is still considered to be one of the biggest matches of the season. The inhabitants of these cities differ extremely in both attitudes and cultures which is clearly reflected on to the football pitch. Vitesse's style of play has long been a source of pride for the supporters, and one of irritation for the NEC fans. Since 1813, Arnhem has been the capital of Gelderland, historically based on finance and trade. Nijmegen, on the other hand, is predominantly a workers' city, where middle and high-income groups are only small minority. People from Nijmegen see Arnhem as arrogant and lazy. De Graafschap are also a rival of Vitesse, but in terms of tension and rivalry, these matches are not as loaded as the duels with N.E.C. Nijmegen. The rivalry has existed for some time with De Graafschap and stems from various causes, such as the opposition between the large city (Arnhem) and the countryside (Doetinchem). Further teams who share a rivalry with Vitesse include FC Twente and AFC Ajax. Past rivalries include local derbies between Vitesse and clubs such as FC Wageningen, Go Ahead Eagles, Quick 1888, Arnhemse Boys and VV Rheden. However, the tension between the local sides lessened as the division of the clubs through playing in different leagues over time became greater. Years of not competing in the same league resulted in less frequent match-ups, until tensions finally settled between the local clubs. For recent transfers, see 2018–19 SBV Vitesse season. The club also have 11 further youth teams: Under-19, Under-17, Under-16, Under-15, Under-14, Under-13, Under-12, Under-11, Under-10, Under-9 and Under-8. Marco van Ginkel began his career in the youth ranks of Vitesse. The Vitesse Jeugdopleiding (English: Vitesse Youth Academy) is a four-star certified youth academy and amongst the strongest in the nation. It has produced Dutch internationals such as Roy Makaay, Marco van Ginkel, Theo Janssen, Ricky van Wolfswinkel, Davy Pröpper, Piet Velthuizen, Martin Laamers, Nicky Hofs and Stijn Schaars. 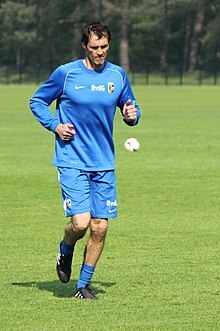 Since 1984, more than 40 successful players have risen through the Vitesse youth system and joined their first team, including: Alexander Büttner, Kevin Diks, Matthew Amoah, Peter Bosz, Onur Kaya, Erwin Mulder, Eloy Room, Adnane Tighadouini, Theo Bos and Riga Mustapha. The academy was officially founded in 2005, when the youth academies of Vitesse and AGOVV Apeldoorn merged. The newly formed academy received the official regional youth academy status from the KNVB and was based on the structure of the former Vitesse youth academy, with the addition of various AGOVV youth players and staff members. The co-operation between Vitesse and AGOVV was terminated as of July 2013, where the academy continued solely as Vitesse's youth academy. The goal of the Vitesse Voetbal Academy is to develop young players into professional football players for Vitesse's first team squad. The academy comprises age-group teams ranging from U8's up to the flagship U19's. The youngest players are scouted at amateur clubs in the direct surroundings of Arnhem. For the age of twelve and older the academy extends its scouting area, mainly to the remaining part of the Netherlands, Belgium and Germany. Until the U12 team, the players only have training sessions during the evening and are largely guided by part-time coaches. When players are ready to join secondary education they start training during daytime. In April 2017, the club won its first major trophy in its 125-year existence. Vitesse in the Europa League. Theo Bos – South Stand. The winners of the cup compete against the winners of the Eredivisie for the Johan Cruijff Shield. Below is a table with Vitesse's domestic results since the introduction of the Eredivisie in 1956. Bos spent his entire career for Vitesse, making a total of 429 appearances in 14 seasons with his club. He is therefore considered to be Mister Vitesse. Van der Gouw is a former Dutch goalkeeper who played most of his career for Vitesse. He amassed a total of 294 matches. John van den Brom played at Vitesse from 1986 to 1993, and from 1996 to 2001. He came back to manage the club from 2011 to 2012. The daily newspaper De Gelderlander conducted a survey in which fans voted Henk Bosveld (r.) as the best Vitesse-player of the twentieth century. Vitesse's reserve team currently plays in the Tweede Divisie (English: Second Division). It plays its home matches at Olympic Training Centre Papendal and it is coached by Joseph Oosting. The team is composed mostly of professional footballers, who are often recent graduates from the highest youth level (Vitesse U19) serving their first professional contract as a reserve, or players who are otherwise unable to play in the first team. Since 1992, Jong Vitesse competed in the Beloften Eredivisie, competing against other reserve teams such as Jong PSV, Jong Ajax or Jong AZ. They have won the Beloften Eredivisie title two times, the Derde Divisie one time, as well as the KNVB Reserve Cup three times. In 1984 it was decided to divide the professional and amateur sections of the club. The professional section was renamed SBV (Stichting Betaald Voetbal – "Professional Football Foundation") Vitesse whilst the amateur section became "(AVC) Vitesse 1892", who played their home matches at the Sportcomplex Valkenhuizen. In total, the club has won 5 trophies; one Derde Klasse title, one Vierde Klasse title, one Zesde Klasse title and two Arnhem Cups. On 2009, Vitesse 1892 was declared bankrupt. The amateur section has produced a number of professional players including Andy van der Meijde, Nicky Hofs, Léon Hese, Erwin van de Looi en Theo Janssen. ^ "Vitesse first Dutch club sold to foreign investor". RNW. 16 August 2010. Archived from the original on 29 August 2013. Retrieved 12 July 2013. ^ Ritsema, André (2000-02-16). "Aalbers moet bij Vitesse weg als voorzitter". NRC Handelsblad (in Dutch). Retrieved 2008-09-21. ^ "Van Wolfswinkel fires Vitesse to first major trophy". Goal.com. 1 May 2017. Retrieved 4 May 2017. ^ "Uefa current ranking". uefa.com. Retrieved 25 September 2017. Wikimedia Commons has media related to SBV Vitesse.